Indoor waterpark resorts have continued to expand throughout North America with 107 open facilities in the United States and an additional 14 open facilities in Canada as of June, 2008. There are 4,138,150 indoor aquatic square feet and 31,865 hotel rooms associated with indoor waterparks as of June, 2008. This family-oriented resort segment has established itself as a viable segment of the travel industry and has expanded well beyond its original Wisconsin base. By the end of 2008, 26 states and five provinces will have at least one indoor waterpark resort. The number of indoor waterparks has grown significantly since their inception in the early 1980s, and the average number of hotel rooms attached to these waterparks has also increased substantially over the years. Between 1998 and 2007 in the United States and Canada, 96 indoor waterpark resorts opened either as new construction properties or as additions to existing hotels. The following table shows the number of waterpark resorts and square feet of indoor waterparks that opened in the U.S. and Canada from 1998 to 2007. 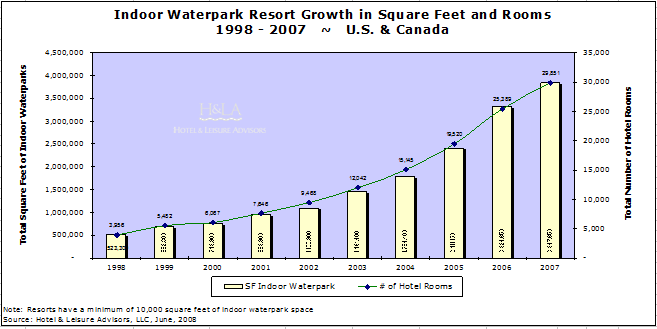 The following chart indicates the number of hotel rooms and the square feet of indoor waterpark space for indoor waterpark resorts during the period 1998 to 2007 for the U.S. and Canada. A hotel with indoor waterpark is a hotel with an attached indoor waterpark with 10,000 to 30,000 square feet of indoor waterpark space where the indoor waterpark serves as an amenity to the hotel versus a true destination. An indoor waterpark destination resort is a resort with 30,000 square feet or more of indoor waterpark space and is considered a true destination resort that families visit on a year round basis primarily to visit the waterpark and secondarily because of other attractions or events in the area. 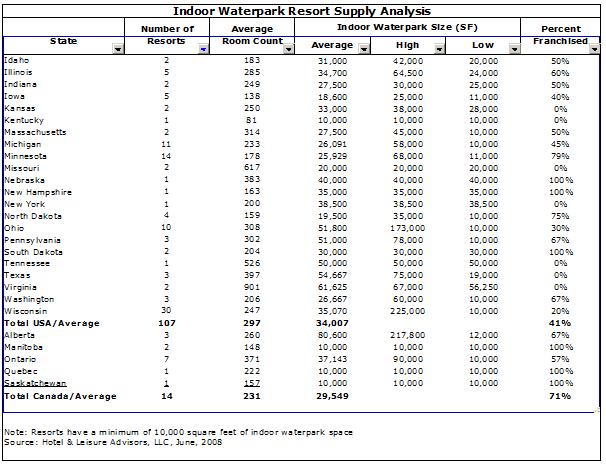 The following table summarizes our supply analysis of indoor waterpark resorts. 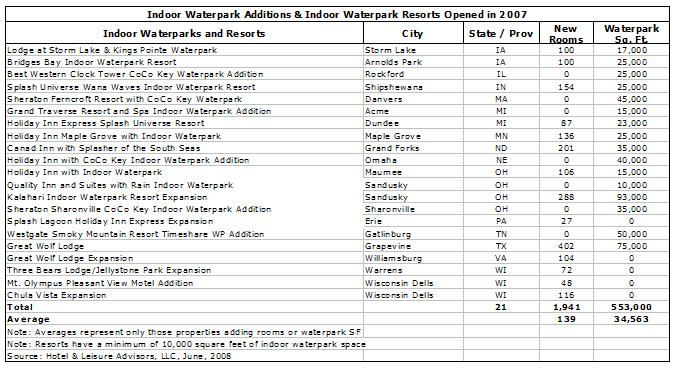 The table indicates that, as of June 2008, there are currently 107 indoor waterpark resorts located in the United States with 28% located in Wisconsin. In addition, there are 14 indoor waterpark resorts operating in Canada, although many other hotels in Canada offer smaller indoor water features with less than 10,000 square feet. Currently, 16 hotels located in Wisconsin Dells, which is known as the “Waterpark Capital of the World,” have indoor waterparks with a total of 4,651 rooms and 738,500 square feet of indoor waterpark space. Most indoor waterpark resorts that are currently operational, under construction, and proposed are located in northern states due to a shorter summer season. The six largest indoor waterpark resorts located in Wisconsin Dells outperformed the franchise Wisconsin Dells non-resort hotels’ overall average occupancy by 17 occupancy points and the average daily rate of the non-resort hotels by $112 in 2006. The average daily rate for these properties includes usage of the indoor waterpark. According to their recent SEC filings, the Great Wolf Lodge properties open in 2007 averaged an occupancy level of 62.2% with an average daily rate of $248.66. However, certain properties in Midwestern markets have shown a decline in performance in 2007 and 2008 due to expanded competition from additional indoor waterpark resorts. Hotel companies, investors, and developers in the U.S. continue to explore the potential benefit of affiliating indoor waterpark resorts with a national hotel franchise. 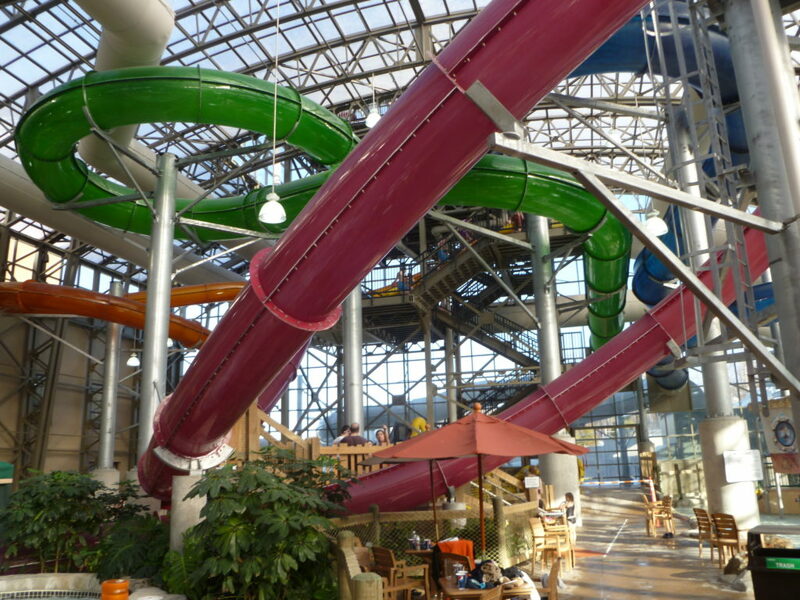 Franchised indoor waterpark resorts are more common in Canada. The previous table shows that only 41% of U.S. indoor waterpark resort rooms are affiliated with a national hotel chain, while 71% of indoor waterpark resort rooms in Canada are franchised. Though the non-franchised resorts can benefit from not paying franchise fees, they lack the benefits of a central reservation system and franchise recognition. 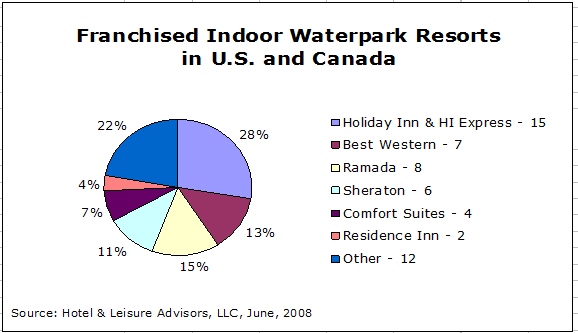 The following chart shows the affiliation of the franchised indoor waterpark resorts in North America. Holiday Inn is the only national hotel chain currently offering an indoor waterpark resort prototype. At present, there are 15 Holiday Inn and Holiday Inn Express properties attached to indoor waterparks, as Holiday Inn has been very open to the idea of allowing franchisees to add indoor waterparks to their existing properties. The overall average ratio of waterpark square footage to guest rooms in indoor waterpark resorts varies widely, with some larger destination resorts offering as much as 200 square feet of indoor waterpark space per guest room while other hotels with smaller indoor waterparks offer less than 100 square feet of waterpark space per guest room. As of June, 2008, the overall average ratio for all existing properties in North America was 130 square feet per guest room. The increase in the number of guest rooms constructed has kept pace with increases in demand for indoor waterparks in most markets, although in Wisconsin, Minnesota, and Ohio oversupply issues are beginning to surface. In these states, some properties with indoor waterparks are recording lower rates of occupancy and average daily rate than they recorded in previous years due to increased competition. 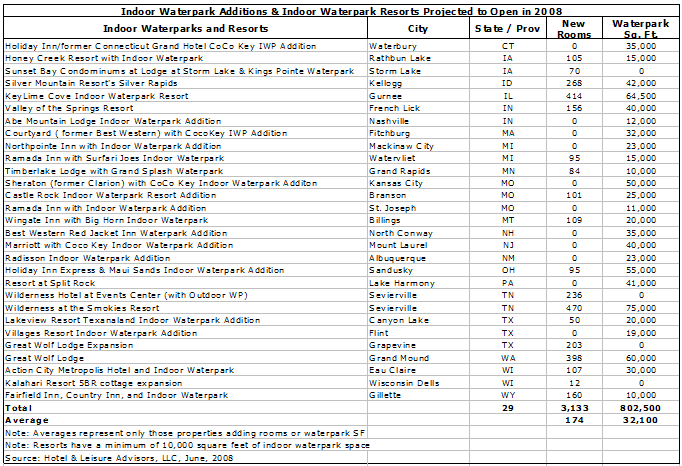 The following table indicates indoor waterpark resorts which opened in 2007 in the United States and Canada. The table indicates that 21 waterparks came on line within new resorts or expansions of existing resorts in 2007. A number of properties which opened in 2007 added or expanded waterpark facilities in existing hotels. The largest indoor waterpark project to open in 2007 was the Kalahari Resort in Sandusky expansion of both the indoor waterpark and the guest room count. The Sandusky property now has the largest single structure indoor waterpark in the United States. Other large projects included the opening of the Great Wolf Lodge Grapevine, Texas, and the opening of the Canad Inn Grand Forks, North Dakota. The 2007 list includes four CoCo Key indoor waterpark facility additions to existing hotels in Rockford, Illinois; Danvers, Massachusetts; Omaha, Nebraska; and Sharonville, Ohio. Our research indicates that there are 29 new indoor waterpark resorts or expansions to resorts which are projected to open in 2008 in the United States and Canada. The following table lists these properties. The table indicates the properties which have opened or are due to open in 2008. Of the 29 total on the list, 17 are new waterpark additions to existing hotels or room additions to existing indoor waterpark resorts. Based on the number of projects that have recently been financed or have begun construction, we project that the number of new construction indoor waterpark resorts will be similar in 2009. Because of the strong performance of indoor waterpark resorts in Wisconsin Dells and other locations, there are many properties considering the development of an indoor waterpark resort. The following table indicates the number of indoor waterpark resorts which are under construction or are in planning or development stages. The table indicates that there are 313 properties in the United States and Canada which are proposing to add indoor waterpark facilities or are developing new construction indoor waterpark resorts. The list has grown substantially over the past two years from 190 properties as of June, 2006 to 313 properties in June, 2008, indicating substantial interest in developing indoor waterpark projects in North America. The previous list includes indoor waterpark resorts known to be in the planning stages or under construction. Of this list, only those with proper planning and financing will be developed. We project a number of these projects will not be developed due to the challenging financing issues which exist in 2008. A number of trendsetting developers are creating exciting concepts in indoor waterpark resort properties. The following bullets describe a few of these projects. Kalahari Resort in Wisconsin Dells is constructing an 110,000 square foot family entertainment center complex which will connect to the existing 752-room Kalahari Resort which includes a 125,000 square foot indoor waterpark. The indoor dry complex will include a six-story Ferris wheel, laser tag, ropes course, a zip line, go karts, bowling, and a variety of other features. This will be the largest dry indoor entertainment complex attached to any indoor waterpark resort in North America. Kalahari Resorts has also announced plans to develop a 715-room indoor waterpark resort in Fredericksburg, Virginia, as part of the Celebrate Virginia complex. This resort will include a 200,000 square foot indoor waterpark which will become the nation’s largest indoor waterpark in one building, potentially being larger than the recently expanded Kalahari Resort in Sandusky, Ohio. This resort project has received a significant tax incentive package from the City of Fredericksburg. Great Wolf Resorts opened the Great Wolf Lodge in Grapevine, Texas, in December, 2007 with 402 guest rooms. This facility is currently being expanded by 203 additional guest rooms and a conference center which are projected to open by year-end 2008. Earlier in 2008, Great Wolf Lodge opened a 398-room resort property in Grand Mound, Washington. The chain now offers 10 locations in the United States and Canada. They have announced plans to construct new resorts in Charlotte, North Carolina and Foxwoods, Connecticut. The Maui Sands Resort in Sandusky, Ohio, opened in June, 2008. This conversion and expansion of a former Holiday Inn now includes 304 guest rooms and a 55,000 square foot indoor waterpark with the only Surfrider in the United States. The Surfrider allows guests to utilize real surfboards as well as body boards in riding the waves. Waveloch, the developer of the Flowrider, developed the Surfrider and sells it in coordination with Aquatic Development Group. Additional installations of both the Flowrider and Surfrider are projected at indoor waterpark resorts. CoCo Key Waterparks have opened at six locations as of June, 2008. 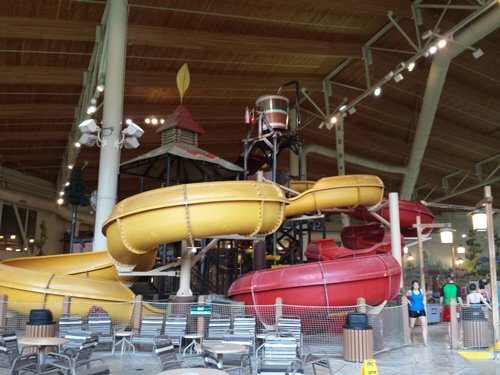 These include indoor waterpark additions at the Cherry Valley Lodge in Newark, Ohio; Sheraton in Arlington Heights, Illinois; Best Western Clock Tower in Rockford, Illinois; Sheraton Ferncroft in Danvers, Massachusetts; Holiday Inn in Omaha, Nebraska; and the Sheraton in Sharonville, Ohio. Additional indoor waterparks projected to open later in 2008 include the Marriott in Mount Laurel, New Jersey and the Courtyard (former Best Western) in Fitchburg, Massachusetts. These projects are being developed by Sage Hospitality, Wave Development, and their partners. The Valley of the Springs Resort is under construction in French Lick, Indiana, and will offer a 156-room hotel with a 40,000 square foot indoor waterpark. The project aims to open by year-end 2008. The resort will pursue certification to obtain a LEED designation, and will be one of the first indoor waterpark resorts to obtain the green building rating designation. The resort will utilize specialized water filtration technology to use less chlorine and less water. The indoor waterpark will offer the largest retractable roof structure ever constructed by the manufacturer, Openaire. Indoor waterpark resorts are expanding their reach as leisure destinations for families looking for a convenient weekend getaway or vacation. In the 1990s, the indoor waterpark resorts were located in the Wisconsin Dells region, but today growth continues throughout the United States. As with the amusement park industry, owners and operators of indoor waterpark resorts have discovered that in order to attract new families to their facilities and keep their repeat guests coming back for more, they need to continually work to add new components and keep the concept “fresh.” We project that the average size of indoor waterparks constructed will continue to increase as customer expectations increase. We project continued development of indoor waterpark resorts in the northern United States as they offer an attractive year-round leisure opportunity for families and attractive investment returns for developers. However, with the substantial growth in supply in the segment, we recommend thorough feasibility analysis be performed for projects to ensure that the project’s return on investment is adequate for the development.